The San Fernando Valley, or “the Valley,” is located in the Los Angeles metropolitan area and is comprised of several cities, including Burbank, Calabasas, Glendale, Hidden Hills, Los Angeles, and San Fernando. Burbank is home to several of the world’s largest media companies, including Disney, Warner Brothers, and NBC/Universal. Despite its prominent role in the entertainment industry, Burbank’s 9.7 percent unemployment rate is up more than six percent from its low in the 2005-2006 fiscal year. With unemployment high, employers may think they can take advantage of their workers, who are motivated to keep their jobs. However, the rights of California workers do not vary with the unemployment numbers. 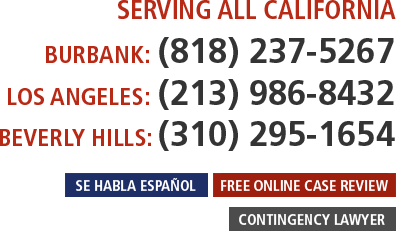 If you have reason to believe that your employer has violated your legal rights, submit your case for review to a San Fernando Valley employment lawyer at Gallenberg PC today. We know California workers’ rights, and will fight to protect yours. You can fill out our quick and easy online Case Evaluation Form; this is the fastest way to get your case screened by an attorney. We do not charge prospective clients for a confidential telephone intake or online case review. Decades ago, the California legislature passed a law that protects Californians from mistreatment in the workplace. Today, the Fair Employment and Housing Act (FEHA) is a powerful tool available to employees who have been treated unlawfully at the hands of their employers. It is illegal for an employer to discriminate against or refuse to hire a person on account of that person’s age, race, gender, sexual orientation, disability, or certain other personal traits. Employees who bring a successful suit under FEHA are entitled to lost wages, compensation for any emotional distress caused by their employer’s actions, and in some cases, punitive damages, which are designed to punish employers for unlawful deeds. The federal Americans with Disabilities Act (ADA) and Title VII of the federal Civil Rights Act of 1964 both protect workers in America from similar forms of discrimination. In addition to being forbidden from doing certain things, such as wrongfully terminating a person’s employment, employers in California are required to adhere to wage and hour guidelines. For example, employers must pay eligible employees overtime and provide workers with rest and meal breaks. These rules vary by industry, which makes calculating the backpay or damages to which you may be entitled a complex task that is best left to an attorney if you feel your employer has violated wage and hour laws. In some cases, current and former employees of a company can bring a class action lawsuit against their employer. A class action lawsuit allows a group of employees who have been wronged in the same way to bring a suit against a common defendant in order to seek justice for all the employees involved. We represent these employees, and will fight to assert their rights every step of the way, through negotiations, arbitration, and even up through trial. In the class action context, we also represent groups of consumers who have suffered injuries or losses due to defective products, financial schemes, or other wrongdoing on the part of corporations. The Burbank employment attorneys at Gallenberg PC understand the rights that California law gives workers. We also fight to protect the rights of consumers who have been cheated or harmed by large companies. With offices in Los Angeles and Beverly Hills, at Gallenberg PC we are ready to help you with your employment and consumer protection issues. Submit your case for our review by using the case evaluation form or begin the free and confidential telephone intake by calling us at (818) 237-5267. We look forward to hearing from you.